Beautifully engraved RARE Certificate from the Hamilton Manufacturing Society issued in 1797. This historic document has an ornate border around it with a wax seal which had the company's name. It is certificate #1. 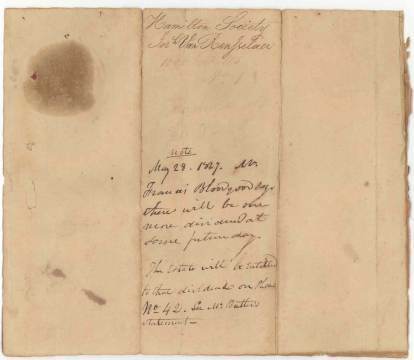 This item is hand signed by the Company's President ( Jeremiah Van Rensselaer ) and is over 205 years old. The document is also signed by Abraham Ten Eyck as Factor. Written on the back of the certificate is 1000 Dollars No.1. which may be the original cost of this share. There were several dividends paid on this; 1-3-1821 $165, 3-31-1821 $50, 3-28-1827 notation states "There will be one more dividend at some future day. The estate will be entitled to that dividend on share #42. See Butlers Statement". This share certificate is on one piece of paper, the unfolded size is about 7 1/4" by 12 1/8". 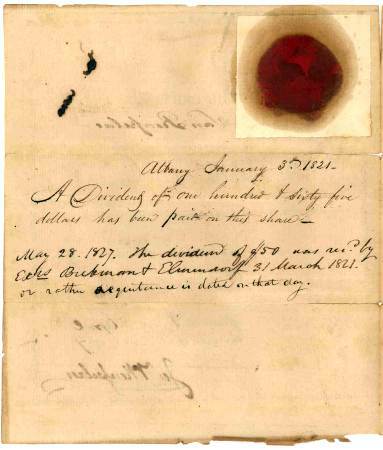 There are some separations to the folds in the center of this document and the wax seal has stained the paper around it which is common for old documents. Overall, this certificate has been well preserved. This item is original and has not been cut or pasted to anything. The Hamilton Manufacturing Society, also known as the Albany Glass Works, was one of the early glass houses in New York State, operating from 1785 to 1815 in the town of Guilderland, about six miles west of Albany. The Glass Works' principal product was window glass, although they also manufactured bottles and flasks. The name of the company was given in honor of the great patron of American Manufacturers, the first Secretary of the Treasury, Alexander Hamilton. Mold-blown historic flasks of one half pint or one quart capacity were made for rum and whisky. The bottles were made in various colors from pale green to almost purple, amethyst, rose yellow, amber, and white. Many have images of notable figures such as George Washington, Benjamin Franklin and Jenny Lind. Jeremiah Van Renssaelaer (1738-1810) was born in New York. and raised at the manor house "Rensselaersvcvck." He was a descendent of Kiliaen van Rensselear, Dutch merchant, director of the West India Company and the first patroon of the Manor of Rensselaer. He graduated from Princeton in 1758, took an active interest in the Revoutionary War and was a member of the Albany Committe of Safety. He was elected to the First Congress and served from 1789-1791. He was Chairman of the Anti-Federal committee during the State Convention Campaign and led Albany County's oposition to the Proposed Constitution. He was also a Democratic elector in 1800, casting his vote for Jefferson and Burr. He was a member of the first board of directors of the "Bank of Albany" in 1792 and became president of the bank from 1798-1806. He was elected Lieutenant governor of New York (1801-1804) and died in Albany, N.Y., February 19, 1810. Abraham Ten Eyck was an attorney and was very close with the Van Renssaelaer family. He was one of the executors of the Will of Stephen Van Rensselaer II.